American lawyer, soldier, and statesman; born in Williamstown, Grant county, Kentucky, July 19, 1834. In early youth he removed to Adams county, Illinois, where he received his education. In 1853 he went to New Orleans, where he took up the study of law, receiving his diploma from the law department of the University of Louisiana in 1855. Throughout the Civil war Jonas fought on the Confederate side, as a private of artillery, and subsequently as acting adjutant of artillery, in Hood's corps of the Army of Tennessee. From 1865 until the consummation of reconstruction Jonas was a member of the Louisiana legislature; and in the Democratic National Convention of 1868 he was chairman of the Louisiana delegation. Jonas was the Democratic candidate in 1872 for the office of lieutenant-governor of Louisiana, but resigned in favor of the Fusion nominee. The same year he was elected state senator. In 1874 Jonas was elected to the office of city attorney of New Orleans, and was reelected in 1876. In the latter year he became a member of the National House of Representatives, serving up to the end of the session of 1877. In Congress Jonas was chairman of the judiciary committee. During this period he was the Democratic national committeeman from his own state. From March 18, 1879, to March 3, 1885, Jonas was United States senator from Louisiana in succession to James B. Eustis. On the expiration of his term of office President Cleveland appointed him surveyor of the port of New Orleans. 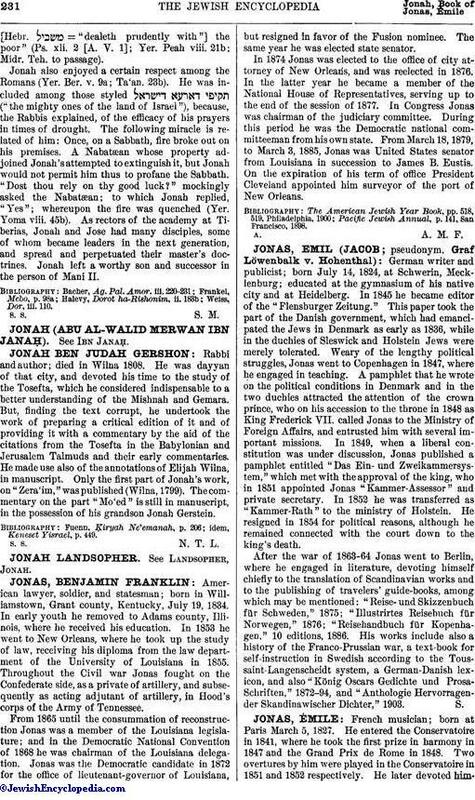 Pacific Jewish Annual, p. 141, San Francisco, 1898.